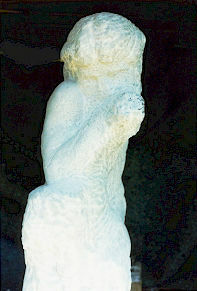 "Karma - The Truth of Christ" Marble Carving. 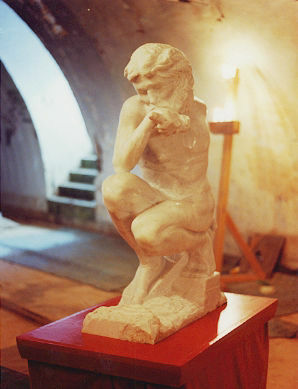 Created from the same quarry of Carrara marble as used by Michelangelo. 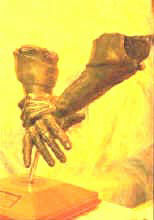 This is the first time in art history that Jesus has been shown to hold the hammer, having nailed himself to the cross. The message is that whoever walks the earth, everyone is wholesomely integral to the greater powers by which we are governed. While no one is denied, no one is exempt. Marble importer, Mr John Mellocco of Sydney, showed his appreciation for a commissioned painting by Robert by arranging for the block to be cut and delivered - a gift of a lifetime. 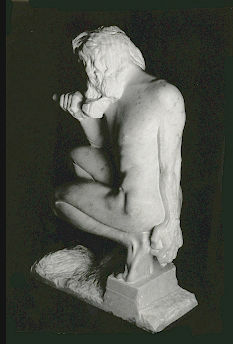 In appreciation, Robert chose a unique subject, with the figure using as much of the block as possible. In the end, the wastage was limited to a small slip on one side: the figure touched the edges of the block on five out of six sides. The piece is for sale, with a minimum price [it may one day be put to auction] of $92,000. It is located in Robert's studio on the South Coast of NSW. This photograph shows the completed work. 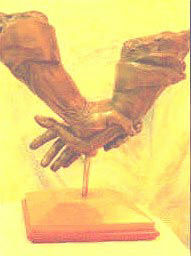 Jesus is standing on the cross; his right hand holds the hammer. His left hand, not seen from this viewpoint, is nailed to the thinner wooden crossbeam. Marble is formed by sea creatures and shells deep beneath the ocean, which solidifies and is then thrust upward where it is available to quarry. 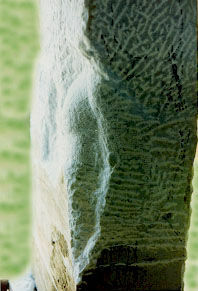 "It is like carving solid moonlight," says Robert, and adds interestingly that the stone is always cool to the touch - even when in direct sunlight. This is how the carving started. And now the artist is well and truly committed to releasing the figure. An intense bond of what can only be described as love exists now between artist and figure. Artists have for many years used power tools to remove unwanted swathes of stone, but Robert chose to honour Michelangelo's method and carved the block by hand. It is not something to be undertaken lightly. The dust mask was the only thing 'sensible' about it! 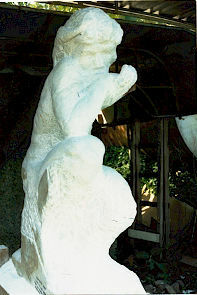 Care has to be taken not to leave parts of the sculpture vulnerable, such as the fingers and handle, during heavy blows to the stone. 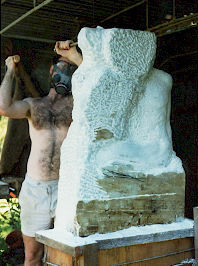 When ready, the artist removes the supporting sections of the work. Can you feel the figure, trapped? And the finished carving was publicly unveiled in an old air-raid bunker in Coffs Harbour, 1991. The bunker was cleared of head-high rubble, and because there was no electricity light was supplied by several hundred candles. Modern day regulations and laws would not allow this exhibition to take place. It was the first exhibition of art in this space, which has since been converted for use as an art gallery. "Our Spiritual Plight" Wood Carving. This piece depicts a woman reaching up for spiritual enlightenment, while holding herself back at the same time. 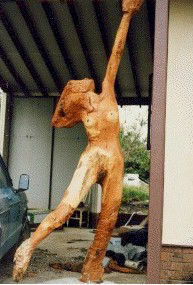 It was carved from a section of Spotted Gum, which is often used for making axe handles. Rather than being detrimental to the figure, the rough nature of this tough Australian timber has provided an uncanny sense of human likeness, right down to the hairline shadows, and knots to form elbows and knees. These photographs show the work well underway. Nothing has been added to this carving; what you see is naturally existing in the original tree section. 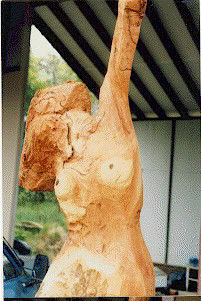 The raised arm of the figure was formed deep within the trunk. The trunk and branches are turned upside down, making for a natural tension within the muscles of the figure. 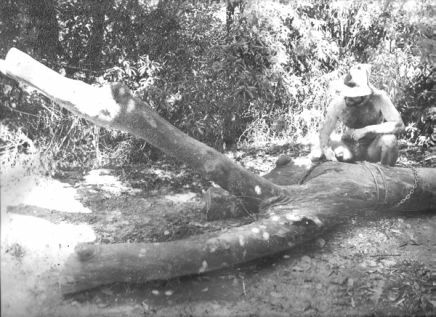 Here is the artist with the original Spotted Gum section. This part of the tree had fallen from the main trunk; split by lightning, it lay on the ground. Initially, Robert initially intended to use a smaller section for a different carving until, as he says, "Something stopped me, pulled me back, and that's when I saw the [finished] figure." Chains chains were used to harness the tree to a 4WD, which was then hurriedly dragged down the highway to the artist's carport where it could be carved. Circa 1984. "The Lost Boy" Wood carving. This photograph shows the Radiata Pine section from which the saddened figure of the lost boy is emerging. Linseed Oil and Turpentine was used to ensure the wood wouldn't crack during carving (though another choice is Tung Oil) and a special anti-blue stain mix is applied to restrict the pine's natural tendency to discolour. And here is the final piece, as another interpretation of an historical Australian art theme - a theme which itself is now lost. The brief for this commissioned piece was to accurately capture the moment of the chiropractic adjustment. Here we see Dr Stanley Bolton, President of the Australian Chiropractic Association, adopting the pose from which the sculpture was to be created. 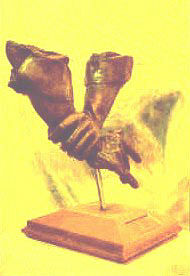 This picture shows the final sculpture, as a work cast in bronze. The cast is made from the wax sculpture which is created in the first instance - professional sculptural wax is a remarkable substance allowing for extensive detail. The Doctor's hands in the final piece show fine features such as hair, veins and distinguishing marks on the arms and fingers. 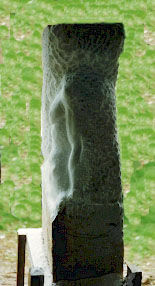 The rod supporting the sculpture in fact forms part of the science of the work. 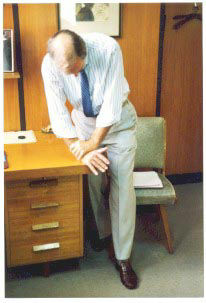 A chiropractic adjustment follows specific angles of force. This is depicted here by the supporting rod, which hits the base at the desired angle of adjustment and from which concentric rings of energy are shown as displaced. The difficulty with this commission was not so much in the accurate rendition of the doctor's hands, but to have the piece appear to thrust into the base. 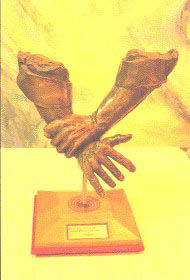 Then, having achieved this, there was the concern for how the arms would be finished so as not to appear as chopped off. This piece is an amalgam of artistic and scientific disciplines.